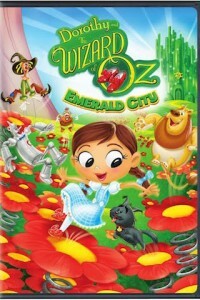 Warner Bros. Home Entertainment is taking viewers over the rainbow, to the magical Land of Oz with the DVD release of “Dorothy and the Wizard of Oz: Emerald City Season One Volume Two”. Close your eyes and click your heels together three times for more animated adventures featuring Dorothy, the plucky Kansas farm girl and her adorable dog Toto, as they star in 10 delightful episodes featured on this entertaining, new release. After the Wicked Witch of the West’s defeat, Queen Ozma has appointed Dorothy the Princess of Emerald City. With her feet firmly grounded in her ruby slippers, Dorothy tackles her royal duties with enthusiasm, bravery and farm girl feistiness. And whether it’s magic, munchkins, flying monkeys or her arch-nemesis Wilhelmina, the wicked witch-in-training and niece of the Wicked Witch of the West, Dorothy is ready to track down and put a stop to any problem that comes Oz’s way. Packed with memorable melodies and iconic Oz imagery, “Dorothy and the Wizard of Oz” is also sure to delight fans of the original books and the classic film The Wizard of Oz. “Dorothy and the Wizard of Oz” is produced by Warner Bros. Animation. Sam Register (“Teen Titans Go!”) serves as executive producer with Jeff DeGrandis (“Dora the Explorer”) as producer. Voice cast includes Kari Dahlgren (“Bunnicula”) as Dorothy and Queen Ozma, Jess Harnell (“Animaniacs”) as Lion, JP Karla (“New Looney Tunes”) as Tin Man, Bill Fagerbakke (“SpongeBob SquarePants”) as Scarecrow and Jessica DiCicco (“DC Super Hero Girls”) as Wilhelmina. Soccer superstar Alex Morgan scores her movie debut with Warner Bros. Home Entertainment in the full-length feature film Alex and Me.